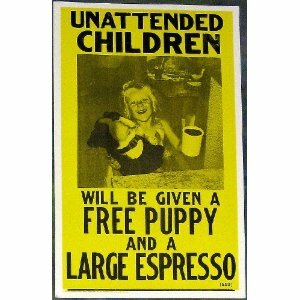 It has been popping up everywhere from cafes to clothing stores and it’s scaring me! Why the joke? Why the empty threat? Why bring innocent puppies into this? And why make things worse with caffeine and incontinent animals? 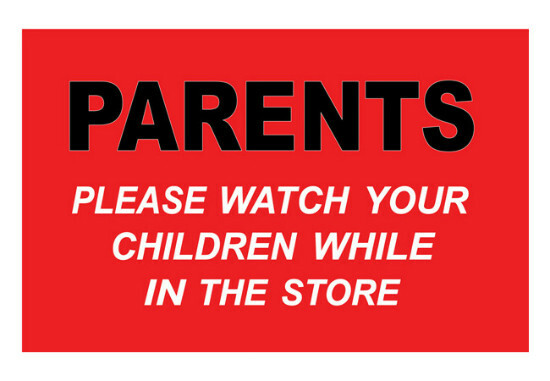 This sign below was seen in Flagstaff, can you imagine if a shop owner posted one of these, but changed it to kids? We would be offended. Parents would be up in arms. 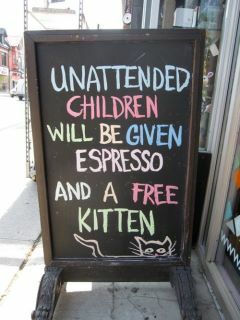 But no, coffee and kittens are funny! Watch this video if you’re considering having a kid! Yes, it is Halloween and no, we shouldn’t be thinking about shopping — certainly not Christmas shopping — yet, but we are. Correction: I’m not thinking about it, but it’s by sheer force of will that I’m resisting. The Halloween candy isn’t even off the racks yet, and my mailbox has been brimming with Christmas catalogs for over a week. I know the economy’s stuck in the ditch, but for the love of all that is spooky can we please hold off until after the jack-o-lanterns have rotted?!?! I’m not a shopper, not a willing shopper, at least. Not in any conventional, recognizable-to-twenty-first-century-humans sense of shopping. Third world markets suit me well for brief photography forays, but Christmas shopping in October? Bah humbug! So when you add dysfunctional minors into the equation, things are liable to get unhealthy quickly. And kids are synonymous with shopping. Though not always in markets… Or maybe they are less annoying and more intriguing when studied through a camera lens.